The old PSP is going out with a bang in Japan later this year, with the October release of a special Gran Turismo PSP hardware bundle. 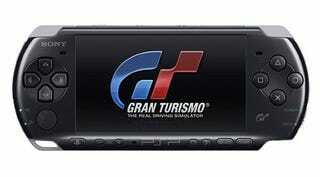 The bundle includes a copy of Gran Turismo PSP and a PSP-3000, which is black with a wee little Gran Turismo logo on the front. Pricing for the bundle is yet to be announced, but if you want the UMD version of the game, it'll cost ¥5480 (USD$58), or you can get a voucher for a download of the game for ¥4190 (USD$44). The bundle is out on October 1. Importers, you know what to do.